The Jackie Robinson biopic "42" is set to open nationwide tomorrow. But Uni Watch readers, ever observant, have already spotted a historical inaccuracy in the film's uniforms. The issue involves the Brooklyn Dodgers' caps. If you're into collecting game-worn gear (or if you're just a serious uniform geek), you may know that the Dodgers' cap logo from the 1940s era had lots of subtle variations -- sometimes thick, sometimes thin, sometimes attached as a separate patch. As you can see in those photos, however, one thing remained constant: The "B" logo was always rendered in white embroidery thread. Let's talk about this situation regarding the Dodgers' cap. It looks like you used a felt logo, instead of an embroidered one, which would have been historically accurate. That's correct, we used felt. 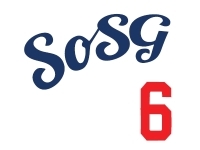 It was a joint decision between the costume designer, Major League Baseball and our company. Obviously, we knew what the Brooklyn Dodgers' caps really looked like. We even had access to some of Jackie Robinson's game-worn uniforms and caps from the L.A. Sports Museum. We made a number of cap samples -- different weights of wool, different stiffness on the bill, different leather sweatbands. And we did try an embroidered logo, but it didn't have the sense of depth and dimension that everyone wanted. When all was said and done, the felt seemed to show up best on camera. Within reason, there are certain liberties taken in Hollywood, and we all felt that this was a minor one. We always strive for authenticity, but we have to live in the real world, and that means it has to look good on camera. Another thing about the cap logo is that the little triangular notch on the left side of the "B" looks much smaller on your cap than it did on the Dodgers' real caps. I know exactly what you're referring to. Again, that's a function of using felt -- some of that detail isn't going to be as fine as it would be if we had used embroidery. If we had opened up that hole a bit more, we wouldn't have had enough felt surface to sew onto the cap. It's another one of those small compromises. OK, there's one more thing about the cap that I want to ask you about. 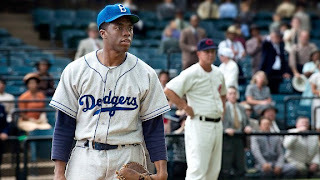 If you take a close look at the poster for "42," it looks like the cap logo in the poster doesn't match the one in the movie stills. What's up with that? I know we made several versions of the cap. [Looks at poster.] You know, I don't think that's the hat we made. It's a different logo altogether. Yeah. That's not one of ours. I don't know where that came from.